It has been really windy outside and recently I hit a clearance sale at a local gardening center on pinwheels, so there are several in our back garden right now and our daughter thinks they’re just absolutely magical. She will be turning 2 in May and it occurred to me that since I intend to do a cupcake tree for her in lieu of a cake, pinwheels would make amazing, fun toppers. 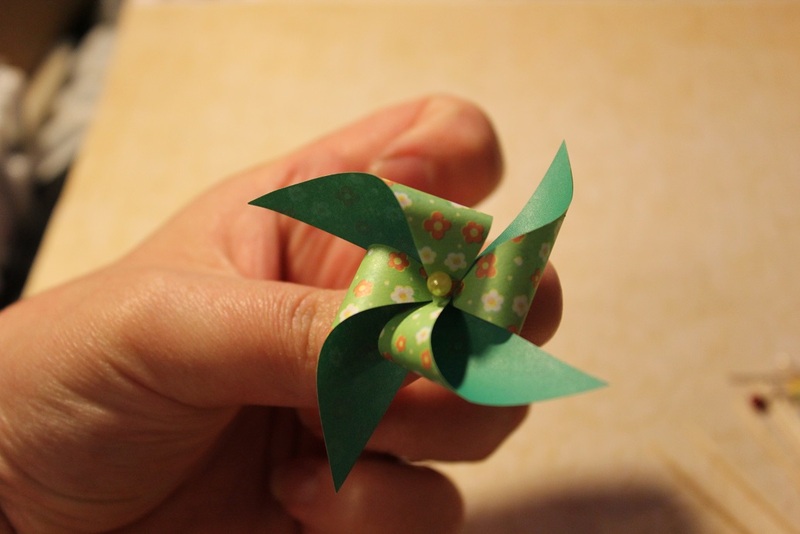 After mentioning my idea to a friend she sent me a link to Etsy where people were selling handmade pinwheel cupcake toppers, but disappointingly they did not spin (pinwheels must spin). They did however give me the idea that it would be ridiculously simple to make my own. 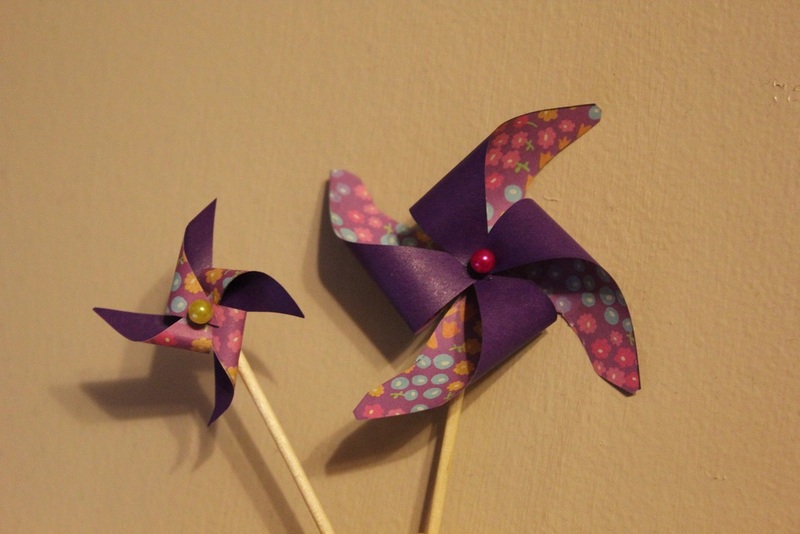 So yesterday I did some experimenting and perfected my methods of pinwheel making which ended up being a lot less labor intensive than I’d imagined it would be. 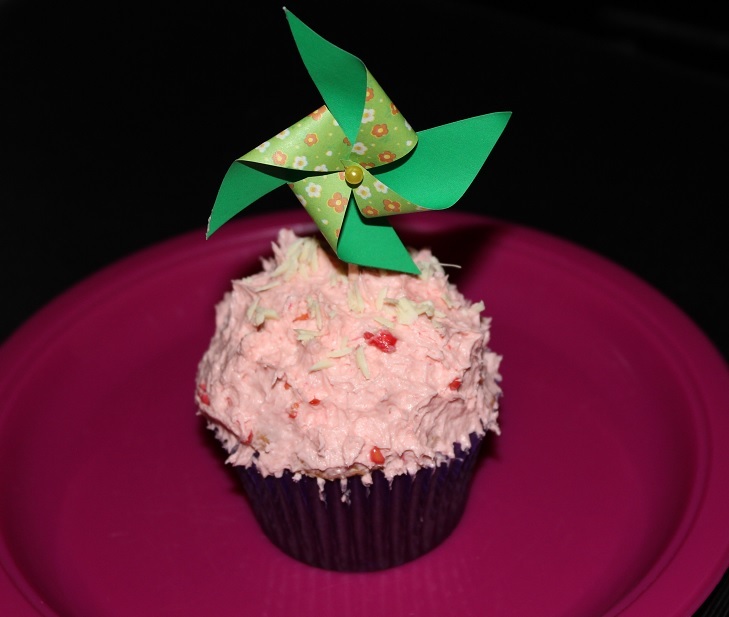 Below I have described in detail how you can make your own easy SPINNING pinwheel cupcake toppers for parties. The first thing that you need to do is make a hole in a toothpick with a pin. I was pleasantly surprised at the fact that this actually worked however, care is required to ensure the toothpick does not split. In order to ensure that the toothpick remained intact I just worked the pin in slowly, wobbling it from side to side as I went to gently make way through the wood. Then once I can see the point starting to poke through the opposite side I flip it over and work on the opposite side until the pin pokes all the way through to the side I’d started on. Next cut out 2 inch squares from whatever paper you’ve rustled up to use. 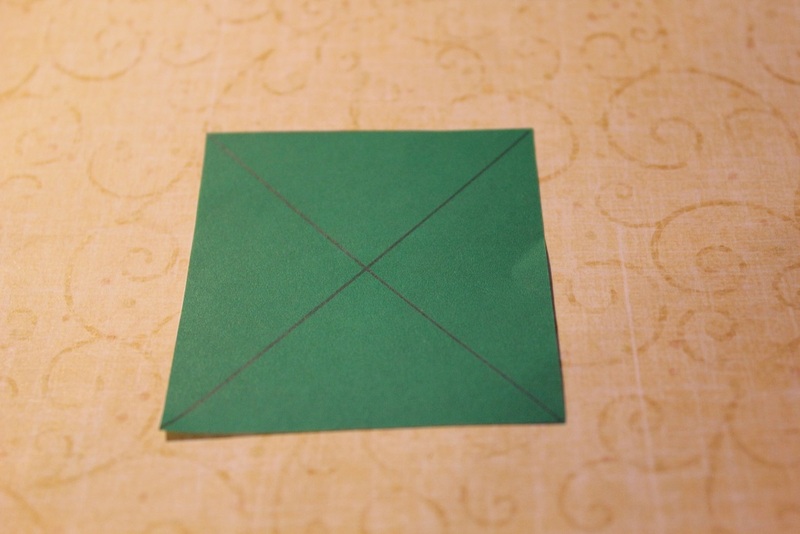 After you have the squares, lightly draw an X between the corners with pencil. Then snip the lines until you’re about 1/4 an inch from the middle of the x and try to gently erase away any pencil marks that you are able to. 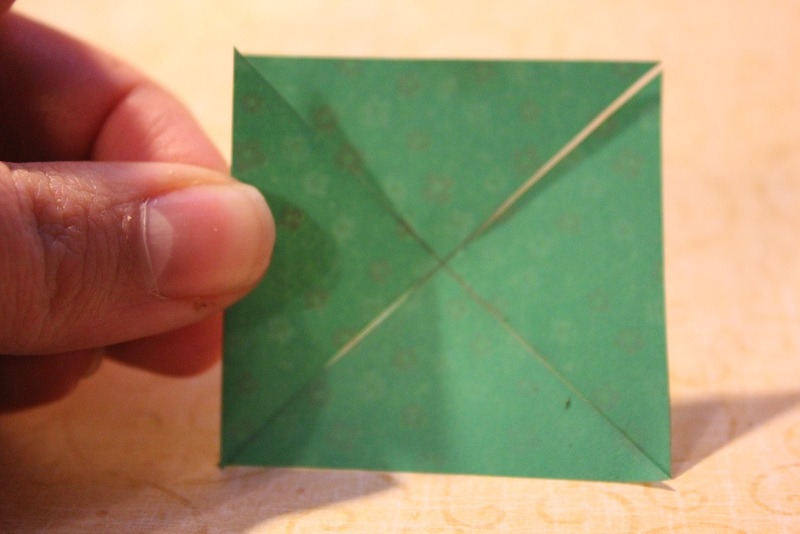 To make the holes just take a pin and poke it through the paper. The best place to do this (so you don’t crease the paper) is on a surface that the pin will push through easily. I just did it on my squishy mouse mat. 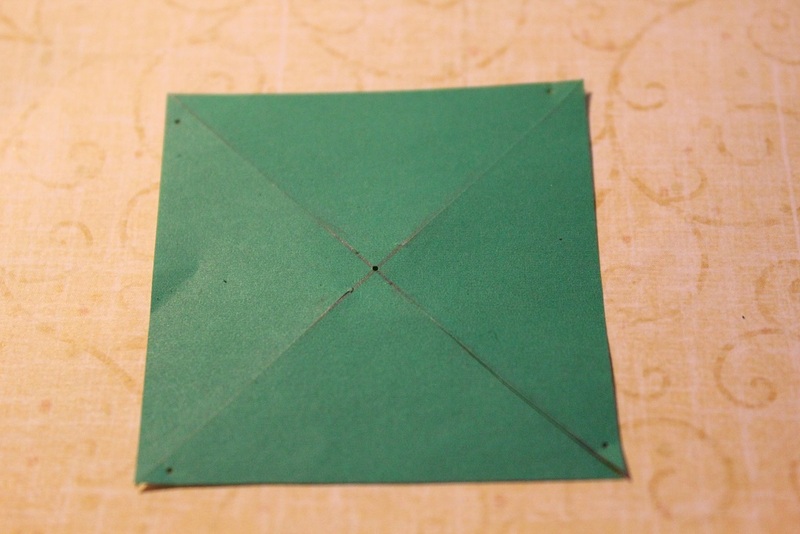 You need one hole in the middle and four holes on the triangles, each in the same location of the triangles for a total of 5 holes in the pinwheel. You can see in the photo that I made the holes on the left corner of each triangle as I rotated it in a clockwise direction. Next thread the triangle corners through the pin in clockwise sequence and then push the pin through the center. 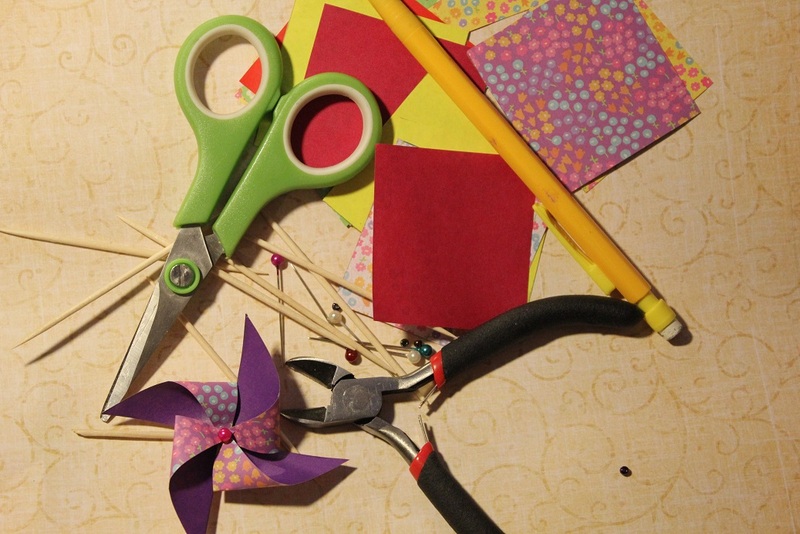 When you pull it together… it already looks like a pinwheel! Take one seed bead and thread it through the back of the pin. 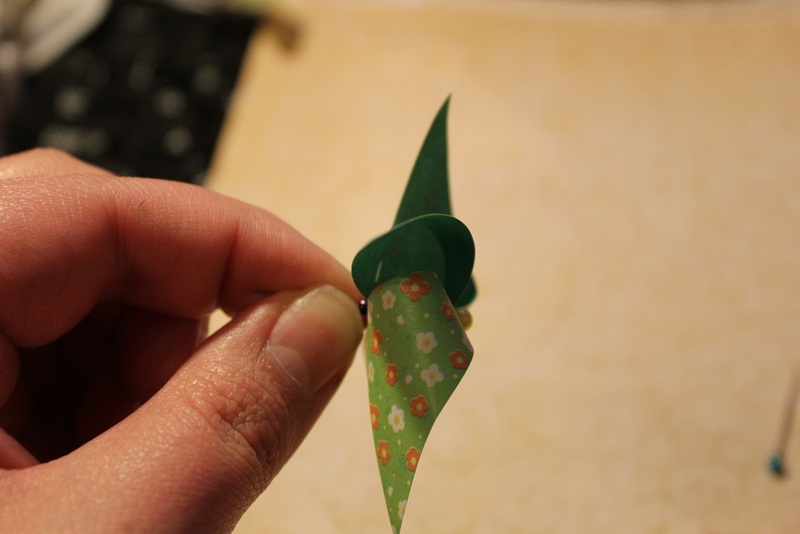 This will act as a spacer between the pinwheel and the stick to allow it room to spin without getting caught on the toothpick. If you try to make these without spacers they may work but they’ll work 100x better with the spacer than without. Thread the pin through the hole you’ve already made in the toothpick and test the pinwheel’s spinning ability by blowing on it gently. you may have to give the pin a bit of slack to allow for easier spinning so that’s why it’s important to test at this stage, before you snip off the pointy end. When you’re happy with the amount of pin you have through the toothpick snip it with the wire cutters and snip off the tip of the toothpick too. As a final touch I also like to put a tiny drop of thick super glue on the pin to seal it, but this isn’t essential. Finished! That’s really all there is to it. 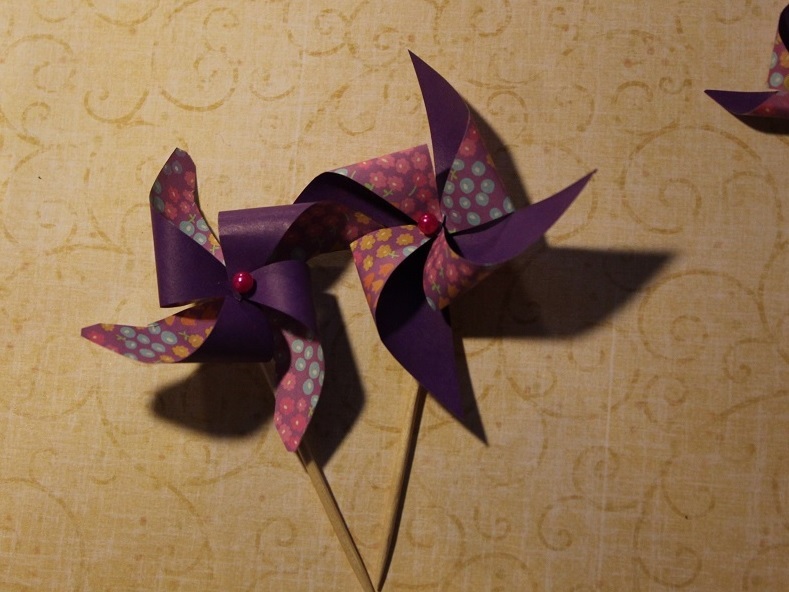 The photo above is an example of two pinwheels made with the same paper from the two different sides. Both are very attractive. This photo is an example of a 2 inch square and a 1 inch square (if you want to go mega tiny. 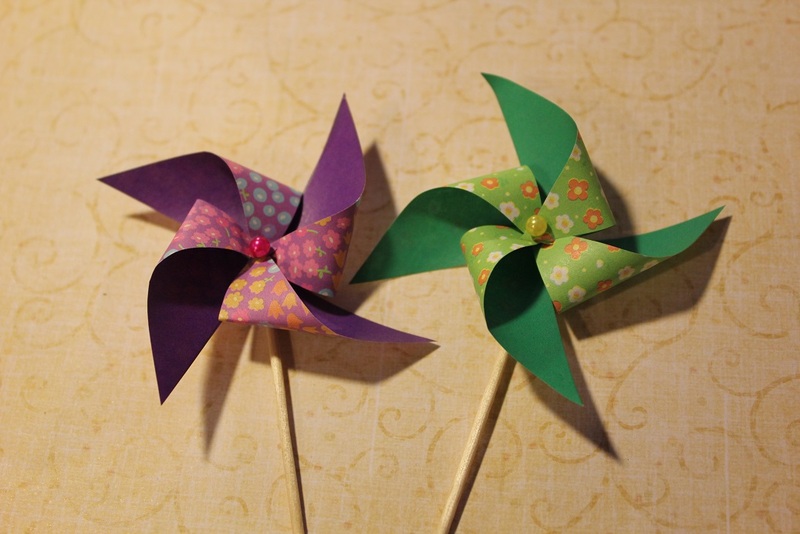 The larger pinwheel also has the ends snipped so that they’re curved. Love this tutorial, thank you! 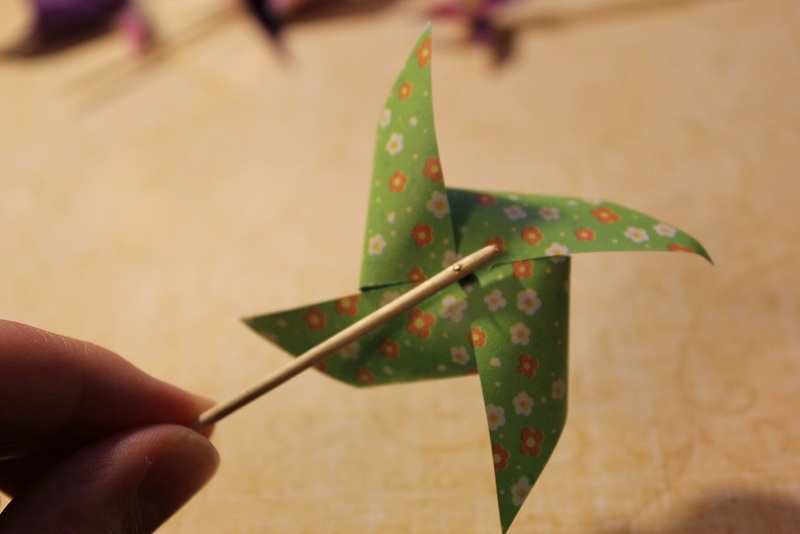 I’m having difficulties getting the pinwheel to “pull together” and stay that way. Any advice? Thanks again! 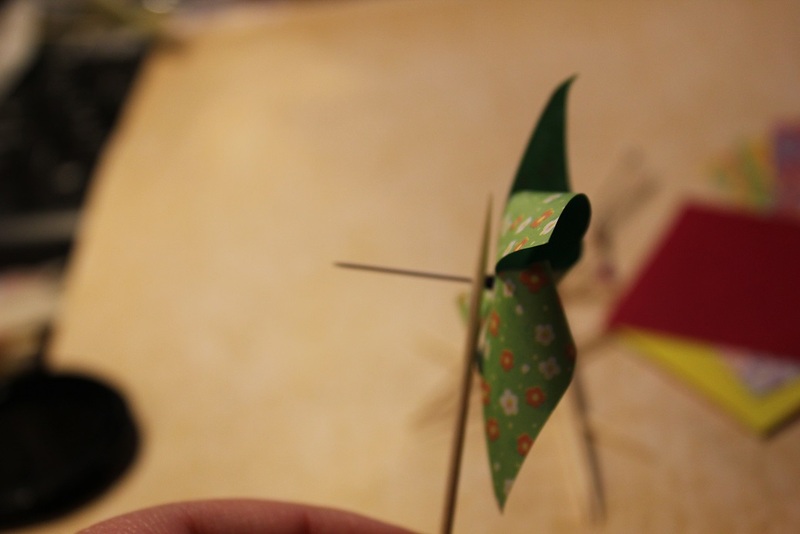 For me, the pinwheel doesn’t pull together and stay that way until I have put the pin back through the toothpick. The tight fit between the toothpick and the pin is important because the pin its self doesn’t need to spin, it just needs to stay put so if the hole in the toothpick has been made too wide you’ll lose that essential friction and the whole thing will want to pop apart on you. 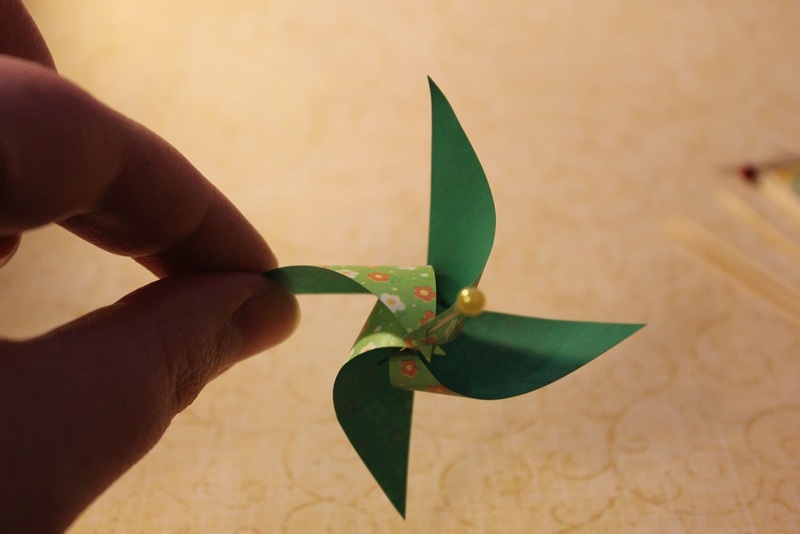 I’ve always wanted to make my own pinwheels (used to know how to as a kid). Thanks for the lovely tutorial!